Conventional wisdom is that the strongest argument against the Standard Model of high-energy physics is the existence of dark matter. There is now very strong astronomy evidence that galaxies are held together by masses that we cannot see. The observable mass cannot account for all the necessary gravitational forces. The missing mass must be some sort of dark matter that is away from the center of the galaxy. The consensus is that there must be some new invisible particle. Many thousands of physicists are looking for it at the CERN LHC and in exotic detectors. 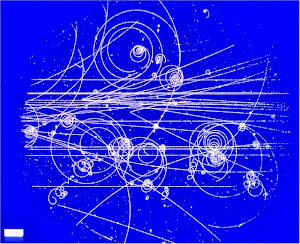 But maybe there is no missing particle, the Standard Model is right, and the missing mass is in black holes? The newly discovered black hole is about 17 billion times more massive than our sun. Another black hole is currently listed in the Guinness World Records as the heaviest, because it may be as much as 21 billion solar masses. But the measurement of that black hole was not very precise and it might actually be less massive than the new one, which is described in this week's issue of the journal Nature. "It has highest confidence of anything I've seen of being the largest black hole," says Karl Gebhardt, an astrophysicist at the University of Texas, Austin and expert on black holes. He was not involved in the study. Astronomers know only of a few black holes that have reached this mind-boggling size. Garden-variety black holes that form at the end of a star's life are much, much smaller. The recent observation of gravitational waves, for example, detected ripples from the merger of two black holes that were each roughly 30 times the mass of the sun. And then there are the so-called supermassive black holes that can be found at the center of galaxies, like the one in our own Milky Way. "I hate to call that one puny, but it has only 4 million solar masses, and we found one that is 17 billion solar masses," says Chung-Pei Ma, an astronomer at the University of California, Berkeley who led the research in the Nature study. What strikes her is that this beast lives in what she called "a cosmic backwater," an average-looking group of galaxies. 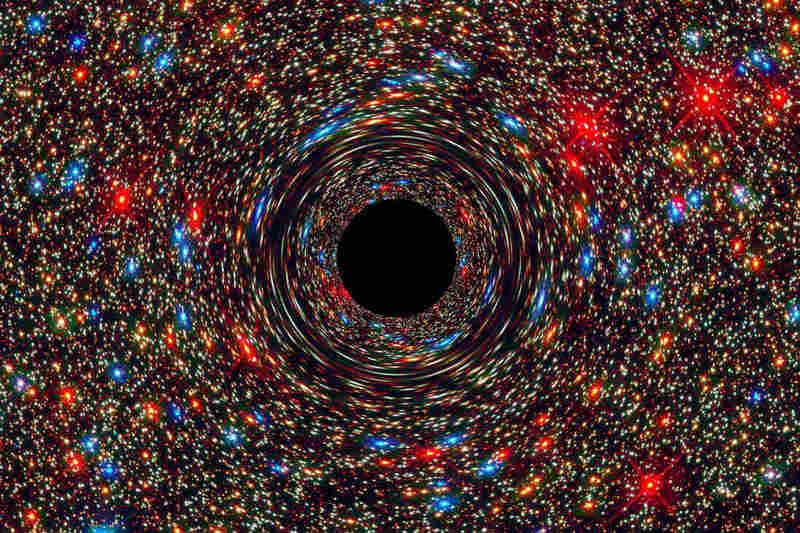 The only other known black holes that are about this size were found in dense clusters of very large galaxies. "It's sort of like, you would expect to find skyscrapers at the center of Manhattan, but this one is more like finding a very, very tall building somewhere in a small town in the U.S. where you would not expect to see something so big," Ma says. "It gives the possibility that these monster black holes are much more common than previously thought." There are also the medium-sized black holes that LIGO claimed to discover, and I mentioned the possibility that they may account for dark matter. Black holes form from collapsing stars. So they are all bigger than our Sun. They can get bigger by swallowing up dust, stars, and other black holes. If there are giant monster black holes, then black holes must come in all sizes, from the star up to the monster. Black holes, contrary to their common image, have the same gravitational effects as any other equal mass in their place. They will draw objects nearby towards them, just as any other planetary body does, except at very close distances. If, for example, the Sun were replaced by a black hole of equal mass, the orbits of the planets would be essentially unaffected. A black hole can act like a "cosmic vacuum cleaner" and pull a substantial inflow of matter, but only if the star it forms from is already having a similar effect on surrounding matter. I think that this is wrong. Block holes act as cosmic vacuum cleaners much more than people think. Black holes get to be big somehow. To get so large, they have to pull in matter at a much greater scale than stars ever do. Stars do not get to be so large. Black holes date back to Michell and Laplace (1783), Schwarzschild (1916), Chandrasekhar (1931), and Penrose and Hawking (1960s). Didn't it occur to any of these guys that black holes might be essential for galaxy formation, and for stabilizing galaxy rotation? The science fiction writers probably worried about accidentally running into black holes, but didn't anyone else take the possibility that black holes were common and structurally essential to galaxies? "Black holes get to be big somehow." The math that even allows for the creation of a 'black hole' (a creation of Hilbert, not Einstein) contains no matter, only gravity. Check up on it, the field equations are also NON-LINEAR, you can't poke more than one mass into a given space time. So, you have a model that can contain only one theoretical mass basically, interacting with nothing. If anyone disputes this, please explain why you haven't published your finding in every physics journal and become famous, as there are no known solutions for more than one mass in a given space time, and over a dozen interpretations of what a Schwarzchild radius describes. Are there incredibly dense gravitational objects in the universe, obviously, yes. Are these objects black holes? Not really. Possibly a black body or some variation, but not a flaky piece of math exuding gravity without matter or volume. If you can call actual objects that are not related to erroneous mathematical artifice a black hole, you can call pretty much call anything whatever else you like as well with similar results. The first step in understanding what is holding the galaxy together would require an actual understanding of what gravity is. We don't have that, just silly linguistics pretending to be explanations. If science can't solve a three body gravitational problem, it isn't ready to lay claim to understanding how galaxies (slightly more than three objects) function. The mathematics is complete gibberish but it can conceal sensible ideas. Infinitely-dense singularities are non-sense idealizations but they might have some kind physical translation. The three-body problem is exactly what I would give as an example of where analytic methods break down and not reality. Luckily, we have computers. No one has ever looked into a black hole, so one can only guess but boundary value physics is nothing new. The problems in physics are largely a result of poor foundations involving "continuous" math, which is basically degenerate discreteness. 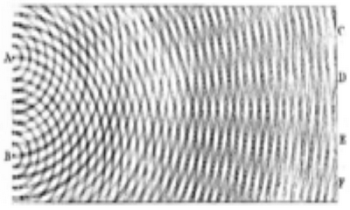 Any coherent idea can be simulated on a computer but what model is correct is not resolvable without empirical verification. I have heard a great deal of misinformation on this topic because many scientists have claimed they have definitive refutations of MACHO, RAMBO, etc... Most stellar black holes are impossible to detect and scientists estimate that there are possibly ten million to a billion of them in the Milky Way alone. That's a huge margin of error! Additionally, we have many hints there are intermediate-sized black holes such as with NGC1313X-1. There can be boatloads of mass to stabilize the rotation curve.